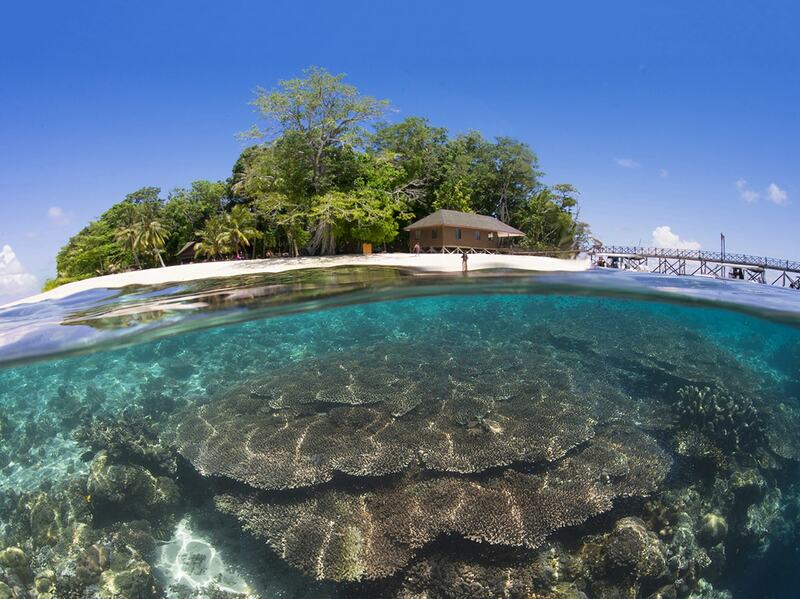 There are many reasons why Malaysia should be on every diver's must-see list of destinations. The waters are among the most bio-diverse in the world, home to more than 3,000 species of fish, hundreds of varieties of coral, and a vast collection of unique invertebrates. Ashore, there are primeval forests to be discovered and highland trails to trek. 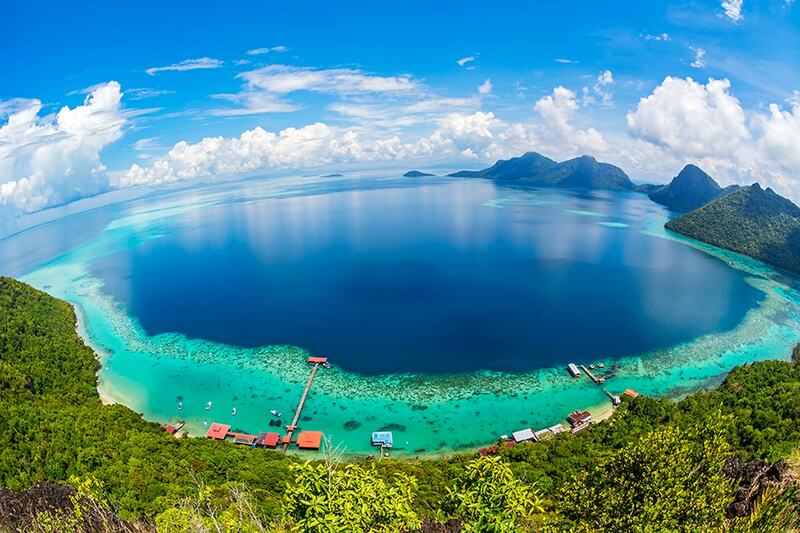 If you don't know Malaysia, it's time to get acquainted with this gem of Asian diving. A water-level view of Sipadan Island shows the sheer underwater walls that drop abruptly to mere feet from the surface to depths of 2,000 feet. Sipadan Island is Malaysia's most famous diving destination. This small island is surrounded by underwater walls that drop abruptly to depths of 2,000 feet. These undersea cliffs become gathering points for huge schools of fish, including of bumphead parrotfish, bigeye trevally and barracuda, which may circle in thousand-fish formations. Sipadan is also a gathering place for hawksbill and green sea turtles, and it's not uncommon to see a dozen or more on any given dive. Eagle rays and white tip sharks are a given on almost all sites, gray reefs congregate in deeper water, and there is always a chance of seeing manta rays or a whale shark. When not awed by the big picture, divers can take a closer look among the hard and soft corals that cover the walls and expand into the her-shore shallows. In addition, a kaleidoscopic array of swirling tropical fish, these sites harbor an intriguing collection of invertebrates, including numerous nudibranchs. Sipadan is also a gathering place for hawksbill and green sea turtles, and it's not uncommon to see a dozen or more on any given dive. Currents at Sipadan can range from mild to exciting. And visibility can soar well past 100 feet. One of the more intriguing dive sites at Sipadan is Turtle Cave, where, at a depth of 60 feet, a tunnel leading into branching passages that lead under the entire island. Most divers take a peek but don't venture into the dark labyrinth, which holds the skeletal remains of turtles who lost their way and perished. 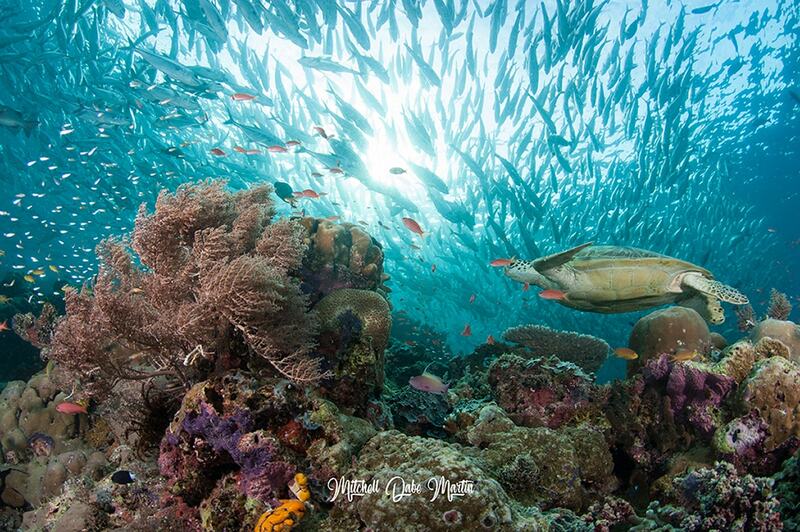 Sipadan Island is now a protected marine park, with access limited to a maximum of 120 divers a day. 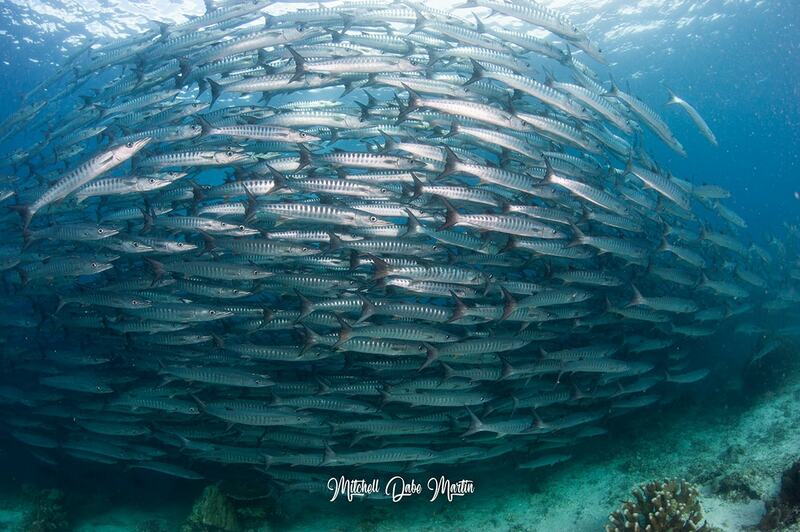 In Malaysia's fish-rich waters, divers may find themselves enveloped in swirling clouds of fish. Offshore pinnacles are particularly good at attracting these massive schools. Because Sipadan is a nature preserve, with no permanent residents, visits to the park begin at resorts on nearby Mabul and Kapalai islands, which are a 20 to 30-minute boat ride away. In addition to serving as a jumping off point for Sipadan, Mabul has earned an international reputation as a muck diving mecca. Surrounding its shores are a mixture of sandy and silty seabeds, coral outcrops, small walls and artificial reefs and jetties that harbor a treasure trove of marine life. 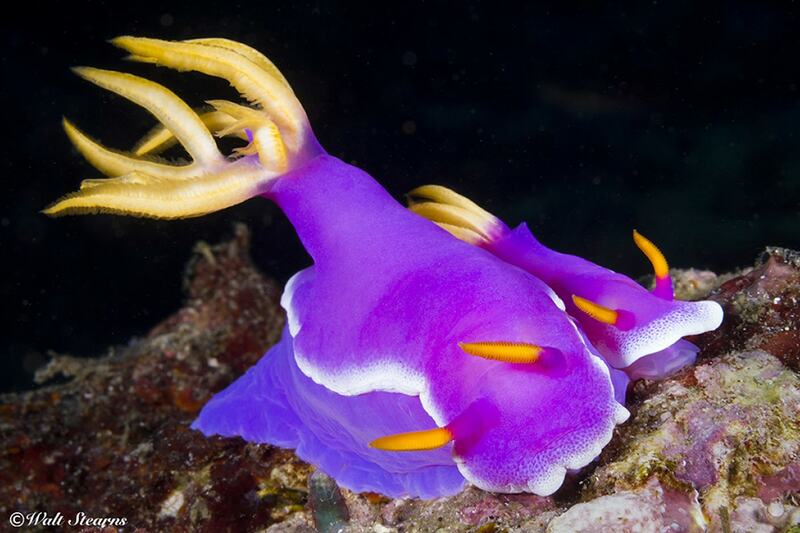 These underwater landscapes are prime hunting grounds for cephalopods, including flamboyant cuttlefish, blue-ringed octopus, mimic octopus and bobtail squids. The Seaventures Dive Rig is a base for trips to nearby Sipadan, and it sits atop a collection of natural and artificial reefs that are a macro hunters paradise. Mabul also overflows with crustaceans, from harlequin shrimp, mantis shrimp, and cleaner shrimp to hairy squat lobsters, spider crabs, porcelain crabs, and more. Keen-eyed divers will find giant, painted clown frogfish along with other ambush predators such as leaf scorpion fish, dwarf lionfish, and crocodile fish. A survey of the bottom will reveal stonefish, stargazers, devil scorpionfish, and flying gurnards. Pipefish are common and tiny pygmy seahorses await discovery. Nearby at the over-water village of Kapalai, colorful mandarin fish perform intricate mating rituals among the pilings, mimic octopus, ghost pipefish and wasp fish lurk in nearby rubble fields. A short swim away, reef slopes drop to open water. 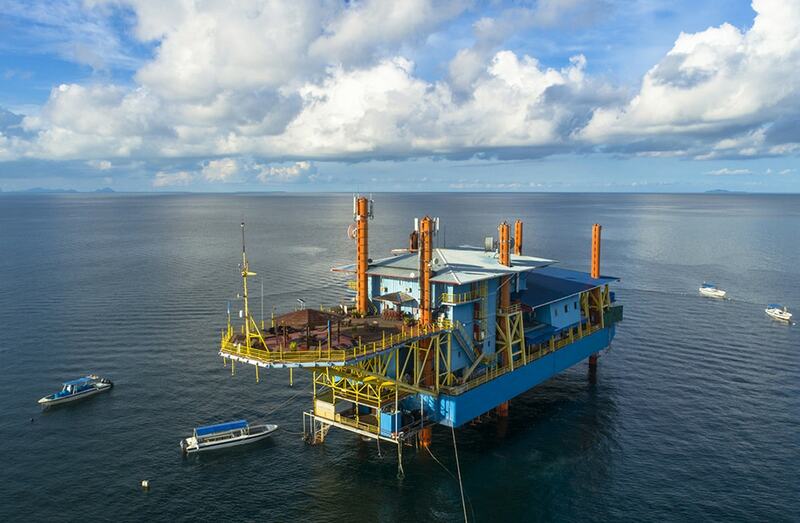 For added interest, there is an extensive collection of small wrecks and other man-made structures centered around an oil platform that has been converted into a dive lodge. Malaysia also has its share of small treasures. From nudibranchs to seahorses, frogfish to decorator crabs and ornate shrimp, areas such as Mabul, Timon and Pulau Tenngol lure macro enthusiasts from around the world. Also topping the list of Malaysian dive destinations is the island of Tioman, which lies 20 miles off the coast of Peninsular Malaysia. Movie buffs might recognize Tioman as the fabled Bali Hai from the classic film South Pacific. With green peaks and spectacular beaches, it has been called one of the world's most beautiful islands. Equally unique is the underwater landscape, which includes many sites riddled with large granite boulders. These natural labyrinths create sheltering habitat for a wide range of marine life and provide divers with interesting swim-throughs to explore. In addition to these signature formations, there are slopes covered in dense growths of hard and soft corals, offshore pinnacles teeming with large schools of fish, and more than a dozen modern and historic wrecks. Seen from above, the shores of Tun Sakaran Marine Park present a tempting invitation to explore walls that begins just a few fin kicks from shore. Well to the west of Tioman and Sipadan, Lang Tengah Island is a lesser-known jewel of Malaysian diving. With no roads and only a limited number of island-style beach resorts, Lang Tengah's main attractions are the white sand beaches, clear waters and thriving coral reefs, which will please both divers and snorkelers. The underwater landscape takes in everything from sheltered coral formations set in shallow water to slopes covered in fields of table coral and offshore pinnacles where currents bring in big fish. No trip to Malaysia would be complete without a visit to the lush rainforests and mountainous highlands of Sabah, home to the Sepilok Orangutan Rehabilitation Centre. Malaysian eco-adventures are handled in the state of Sabah, which is a land of rainforests, mountains and traditional villages. 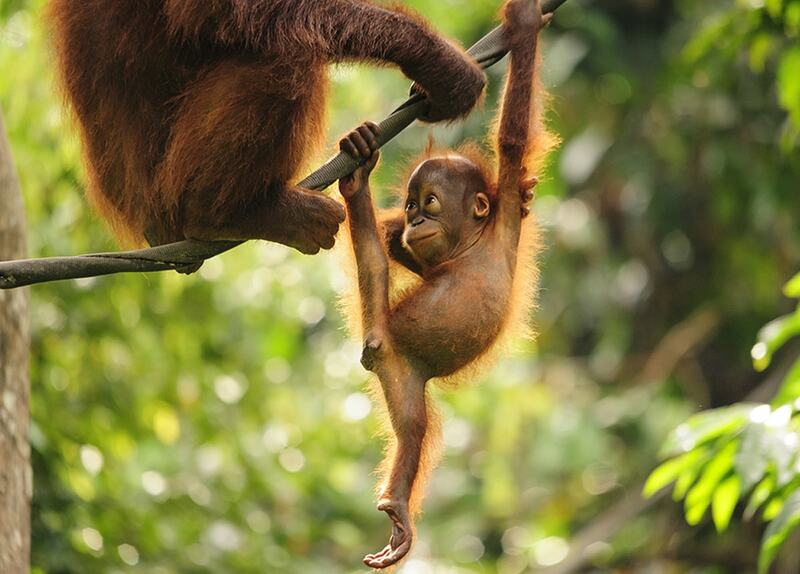 Here, towering treetop canopies are home to orangutans and comical pot-bellied proboscis monkeys. Pygmy elephants roam jungles and grasslands, while crocodiles lurk on the banks of the Kinabatangan River. A centerpiece of the region is Mount Kinabalu, the tallest peak in Malaysia at more than 13,000 feet. An ascent of this peak is a multi-day adventure that's not for everyone, but there are also a number of easier treks into the surrounding upland forests. This area is known worldwide for an unrivaled botanical and biological species biodiversity. Botanists have documented more than 6,000 plant species in this part of Malaysia—a greater number than in all of Europe and North America combined. Adrenaline junkies can go white water rafting on the Padas and Kiuli Rivers, while more leisurely cruises of the Kinabatangan river carry visitors through a wildlife sanctuary that is home to more than 200 species of birds. Other favorites include visits to the Sepilok Orangutan Rehabilitation Center and the Gomantong Caves, where passages soar to nearly 300 feet high. We work with Malaysia's top dive resorts and tour operators to create special diving packages and land adventures. To learn more, call us at 800-330-6611 or send a note to sales@caradonna.com.